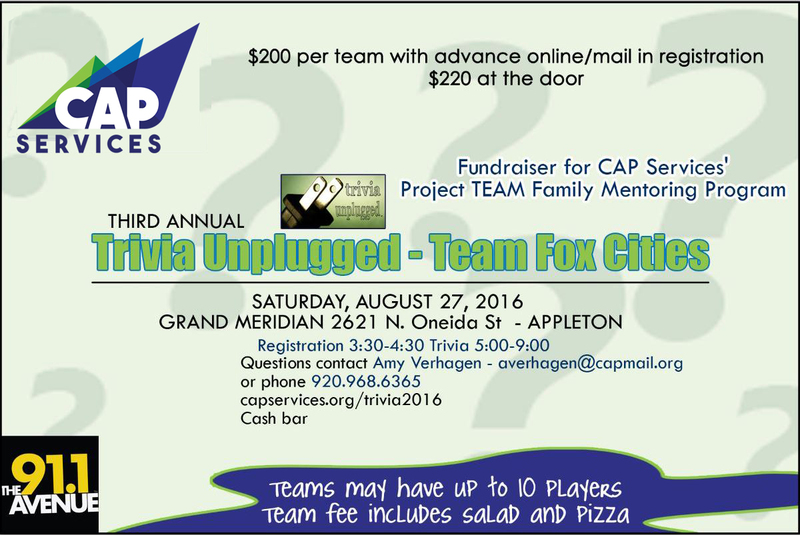 Team Fox Trivia Unplugged 2016 – CAP Services Inc.
Trivia Unplugged, a fun twist on a popular central Wisconsin trivia contest, was held at the Grand Meridian in Appleton on Saturday, August 27, as a fundraiser for CAP Services’ project Team Family Mentoring program in Outagamie County. Trivia “unplugged” will run from 5 to 9 p.m. at Grand Meridian, 2621 N Oneida St., Appleton. The family friendly contest will challenge teams of 4 to 10 players to test their pop culture and media knowledge with questions about radio, television, music, sports, and other topics. Jim “The Oz” Oliva, long-time co-writer and organizer of WWSP 90FM’s Trivia Contest at UW-Stevens Point, will write the questions and host the Appleton event. Unlike the radio contest, teams at the Appleton event will not be able to use electronic devices to search for answers as the rules prohibit cellphones, computers, and communications devices. Books and outside paper are also not allowed. Teams will be asked a total of 64 questions, 16 questions per hour over four hours of the event. Points will be determined based on how many people answer correctly – the fewer the number of correct answers, the higher the points, and vice versa. The team with the highest point total at the end of the night takes home a trophy. Pre-registration is encouraged and costs $200 per team (day-of registration costs $225 and is dependent on available space). Team registration may be completed either online through using a credit card, or by mail or in person using a check.